A stunning NEFF top spec HOB. (NEFF - 2 Year Parts & Labour). FOR ANY EXTRA INFO and best prices! WE HAVE OVER 20 YEARS EXPERIENCE IN THE FIELD OF DOMESTIC APPLIANCES WHICH IS WHY WE ARE STRIVING TO OFFER THE BEST DEALS WE CAN! 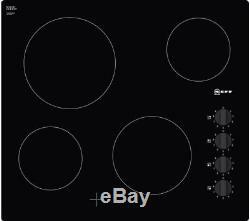 Technical specifications for NEFF T16CK40X0 Electric Ceramic Hob - Black. Front right: 2 kW - Front left: 2 kW - Back right: 1.2 kW - Back left: 2.2 kW. 2-stage residual heat indicator for each zone. This product requires hardwiring to a 16 Amp fuse and should be installed by a qualified engineer, such as one of our Knowhow experts. Minimum distance required / Minimum clearance above hob. Neff 16CK40X0 Electric Ceramic Hob. 46 x 592 x 522 mm (H x W x D). 100 x 590 x 522 mm (H x W x D). All goods comply with all applicable legislation and customers are reminded that their statutory rights are not affected by these terms and conditions. We at Graded Outlet Appliances use the information supplied to process and. To provide you with our services, it is necessary for us to hold and process certain information about you. We take reasonable care to keep this information secure and prevent and unauthorised access or unlawful use of it. We process all personal information in accordance with applicable UK Data Protection Legislation. This information will be stored and used to process your order. All prices are inclusive of the Current Vat Rate. Our Couriers makes deliveries Monday to Friday, between 0900 and 1800 hrs. They do not make deliveries during the weekends. All our deliveries are made on vehicles with tail lift facilities, and they will unload the pallet, and get it as near as they can to the entrance to your building. They use a pallet truck, so as long as access is via a smooth level driveway, there will be no problems. If, however, you live at the end of a steep or gravelled drive, then the driver will not be able to negotiate it with his pallet truck. This is particularly important if your property is not accessible from the road, or if it is not a ground floor property. Please bear in mind that heavier items such as washing machine can not be moved by one person. However, the Content must not be used nor reproduced (in whole or part) for any other purpose including on or in connection with another website or publication or for direct commercial gain. Applicable law may not allow the limitation or exclusion of liability of certain damages, so this limitation or exclusion may not apply to you in its entirety. Legal advice should be sought in cases of doubt. We operate and are registered under the Data Protection Act. VALIDITY OF PROVISIONS AND REMEDIES. Each provision of these conditions is severable. If any provision is or becomes invalid or contravenes applicable regulations then the remaining provisions will not be affected. Our rights and remedies under these conditions are cumulative and are not exclusive of any rights or remedies provided by law or contract. No waiver by us of any breach of these conditions shall constitute a waiver of any other breach. No failure by us to exercise any remedy shall constitute a waiver of the right subsequently to exercise that or any other remedy. The item "NEFF T16CK40XO 60CM CERAMIC HOB 2 YEAR PARTS AND LABOUR WARRANTY" is in sale since Thursday, February 15, 2018. This item is in the category "Home, Furniture & DIY\Appliances\Cookers, Ovens & Hobs\Hobs". The seller is "gradedoutletappliances" and is located in Ilford. This item can be shipped to United Kingdom.